This picture was taken in Hamburg last month. This Santa is located where they have their Christmas Markt every year. You all have a good Holiday Season. Thank you dear CI. I wish you only the most peaceful Merry Christmas and an adventurous New Year. Bonne voyage whereever you find yourself! Wow! that photo is a wonderful Christmas gift. I've never been to Hamburg around Christmas. Kinda wish I had when I was younger. Merry Christmas and Happy New Year to you Mr. Travelling Man! Merry Christmas with this picture below and if you feel like it .......a description what would be served as a rule. 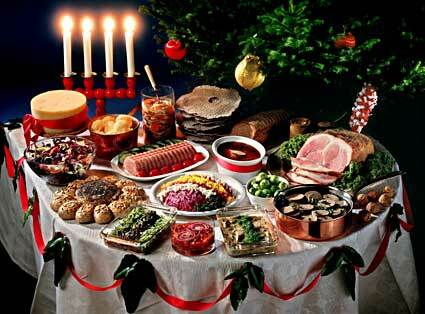 A special Swedish type of smörgåsbord is the julbord which is the standard Christmas dinner in Sweden. Julbord is a word consisting of the elements jul, meaning Yule (today synonymous with Christmas) and bord, literally table. The classic Swedish julbord is the highlight of Swedish cuisine, a traditional starting with bread dipped in ham broth and continuing with a variety of fish (salmon, herring, whitefish and eel), ham, small meatballs, head cheese and sausages, potato, boiled or potato casserole, soft and crisp bread, butter and different cheeses, beetroot salad, cabbage (red, brown or green) and rice pudding and beverages. ,Tthe traditional julbord is typically eaten in three courses. The dishes include local and family specialties. The first course would typically be a variety of fish, particularly pickled herring and lox (gravlax). It is customary to eat particular foods together; herring is typically eaten with boiled potatoes and hard-boiled eggs and is frequently accompanied by strong spirits like snaps, brännvin or akvavit with or without spices. Other traditional dishes would be (smoked) eel, rollmops, herring salad, baked herring, smoked salmon and crab canapés, accompanied by sauces and dips. The second course is often a selection of cold sliced meats, the most important cold cut being the Christmas ham (julskinka) with mustard. Other traditional cuts include homemade sausages, leverpastej and several types of brawn. It is also common to serve the cold meats with sliced cheese, pickled cucumbers and soft and crisp breads. The third course would be warm dishes. Traditionally, the third course begins with soaking bread in the stock from the Christmas ham. Warm dishes include Swedish meatballs (köttbullar), small fried hot dog sausages (prinskorv), roasted pork ribs (revbenspjäll), and warm potato casserole, matchstick potatoes layered with cream, onion and sprats called Janssons frestelse (literally "Jansson's Temptation"). Other dishes are pork sausages (fläskkorv), smoked pork and potato sausages (isterband), cabbage rolls (kåldolmar), baked beans, omelette with shrimps or mushrooms covered with bechamel sauce. Side dishes include beetroot salad in mayonnaise and warm stewed red, green or brown cabbage. Lutfisk, lyed fish made of stockfish (dried ling or cod served with boiled potato, thick white sauce) and green peas that can be served with the warm dishes or as a separate fourth course. Lutfisk is often served as dinner the second day after the traditional Christmas Yule-table dinner.Julbord desserts include rice pudding (risgrynsgröt), sprinkled with cinnamon powder.photo Traditionally, an almond is hidden in the bowl of rice porridge and whoever finds it receives a small prize or is recognized for having good luck. Julbord is served from early December until just before Christmas at restaurants and until Epiphany in some homes. Merry Christmas one and all. German Christmas markets are so populat that we've got one. When I went on the Norwegian Coastal Cruise a couple of years ago, they served all varieties of herring for breakfast, lunch, and dinner on the Hurtigruten ship, MS Nordlys, - which I've always enjoyed. With the exception of lutfisk, sounds delicious. My maternal grandmother was Norwegian, and my paternal grandma was German, so I always eat roll mops during the holidays. it's a German dish but the herring is very Norse. As a nod to Grandma Magnuson I also have a big chunk of Jarlsberg. Lovely pic, ci. Merry Christmas and a joyous New Year to you and yours.